RoundUp is a probable cancer causer!! Over 30 years ago, Monsanto Lab tests concluded Glyphosate (Round-Up) exposure was linked to mice developing Non-Hodgkin’s Lymphoma and Renal Tube (Kidney) Cancer. 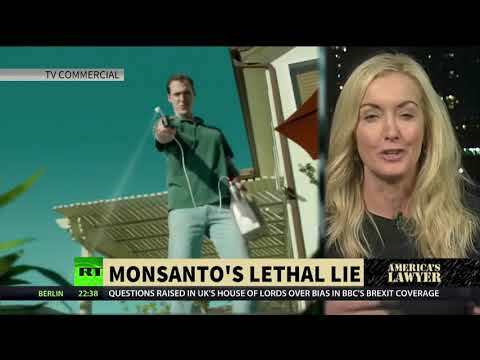 Watch the above video for a little background information and details about how the EPA and Round-Up maker Monsanto have misled the public about the herbicide’s dangers to public health. Pesticide Alternatives Abound – try this, instead…. OK, so it’s not exactly pickling, but by applying this common household item, white vinegar, to weed leaves, they’ll die off and make room in your yard for more desirable plants. The white vinegar sold in grocery stores is about 5% acetic acid, which is usually strong enough for most weeds, although a more industrial strength version (up to 20% acetic acid, which can be harmful to skin, eyes, or lungs) is available in many garden supply stores. The vinegar can be applied by spraying full strength onto the leaves of the weeds, being careful to minimize any overspray on garden plants and nearby soil. Repeated applications may be necessary, and the addition of a little liquid dish detergent may improve the effectiveness of this homemade herbicide. Another common homemade herbicide recipe calls for combining table salt or rock salt with white vinegar (1 cup salt to 1 gallon vinegar), and then spraying this mixture on the foliage of weed plants. Adding liquid soap is said to help the efficacy of this weedkiller, as is the addition of certain oils, such as citrus or clove oil. What Is Traditional Chinese Medicine & Which Health Conditions Does It Work For? Please provide your contact information below and we will be in touch just as soon as possible.